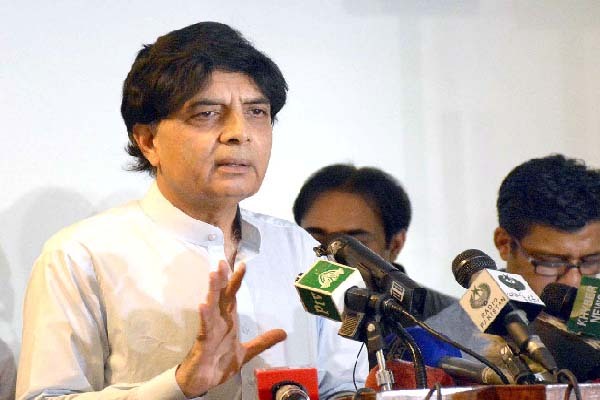 ISLAMABAD, July 4 (APP): Minister for Interior, Chaudhry Nisar Ali Khan on Monday said army would be deployed for security and to ensure free and fair forthcoming elections in Azad Jammu and Kashmir. “Transparency and fairness of elections in AJK is extremely important in view of sham elections across Line of Control (LoC) and we are trying to ensure fair elections upon which no one can raise finger,” he told newsmen after inaugurating NADRA Mega Centre in Islamabad. Despite other commitments such as fear of floods, Pakistan Army has committed to provide troops for the purpose while Punjab and Khyber Pakhtunkhwa have also been asked to contribute forces, he said and added in all 22,000 personnel would be deputed for elections in Azad Kashmir by 18th or 19th of this month. Replying to a question, the Minister said Rangers in Karachi are mandated to tackle terrorism, extortion, kidnapping for ransom and target killings and there has been a significant reduction in these crimes there while as per police figures increase has been witnessed in number of street crimes. Chaudhri Nisar said there has been much progress in one of the two recent incidents of killing of Amjad Sabri and kidnapping of son of Chief Justice of Sindh High Court. Replying to another question, the Minister said those who were raising hue and cry over corruption are also involved in purchasing properties abroad. Nisar said Asif Ali Zardari and Bilawal Bhutto are only leaders of political parties who have not yet declared their assets and added Zardari remained in power for five years but did not declare his assets. The Minister said Bilawal should also explain from where money came to buy three palaces in Dubai and other properties in different countries and added Bilawal should also ask his father from where he got money to buy properties abroad. Replying to a question, he said NADRA would formally start sending SMS to family heads after Eid holidays to confirm their family trees, adding that NADRA has received 200,000 SMS from citizens and 5,000 citizens have pointed out intrusion in their trees. Of the total, 950 have been confirmed fake or aliens, he added. prepare a comprehensive national policy on the matter, he added. principles the Afghan refugees would stay in Pakistan. Quetta while Karachi would have two centres. He said the government is taking solid steps to provide modern facilities to the citizens. The center would offer all NADRA services, including identity cards, child registration certificates and family registration certificates in minimal time. for rights of Muslims in India.